As Abingdon is right on our route home from Goodwood, it would have been rude not to call in to the birthplace of the B on the run back from the Festival of Speed. The site old factory is now a retail park, but the County Hall museum in the town centre does have a good permanent exhibition where, alongside historical items of interest dating back to the origins of the town, sits the last B roadster off the production line in 1980 surrounded by a nice selection of documents and brochures from the time. Interestingly despite the little time between this B and mine, I noticed a few differences such as a plastic petrol cap and notches in the headlight trim. Also what stood out was just how shiny the rubber bumpers were - I mean these things shone! Upstairs, as it is the 90th anniversary, there was also a temporary exhibition with a load more artefacts - from Cecil Kimber's coat to wooden prototypes to a typewriter from the offices. The most interesting one for me was the plan of the works (see photo) which showed the route cars took around the buildings during assembly. There was also a video showing the heritage parts being fabricated and how the B downstairs was lifted into the upstairs windows below (with 15mm on each side to spare!). In all a really good exhibition, especially considering the size of the place. 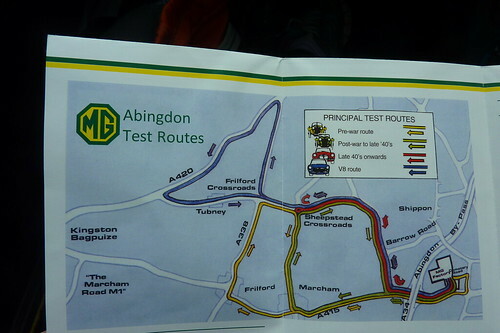 On the way out I decided to run the car along the old test routes which every car from the factory travelled down (see photo) - at least until 1975 when the rolling road was installed and the majority were tested on that. The standard Bs' route is not very long, I guess just long enough to get the car warmed up to test out the thermostat and a short sprint to check the overdrive function. This is really just running along country lanes and probably hasn't changed in the past 40 years, having hedges on both sides. Funny to think my B might have already done this once before! As the B route just doubled back on itself we continued along the V8 route. This moved onto faster roads, opening out into what is now a dual carriageway, before heading back along country lanes before rejoining the standard B route. This little stretch is apparently where they used to take Lucas representatives to test out headlight designs as the road is pretty straight with a gentle rise and fall - the happy location of the Dog House pub here I'm sure had no influence! In all the B did around 700 miles over the weekend with not a grumble - to date the longest trip I've done with it, so I'm very happy!